1372mm High with 25mm diameter upright. a single 483mm diameter ring with 20 hooks. A Revolving Tie and Belt Rail provides an easy browsing solution, ideal for displaying a variety of ties, belts or scarves in any retail environment. 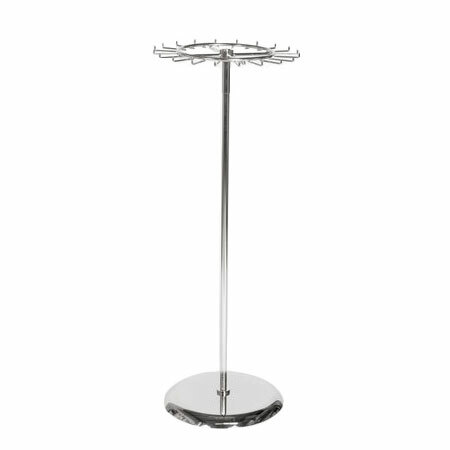 This free standing revolving rail stands 1372mm high and comes complete with a 483mm ring with 20 hooks. The weighted base makes this rail very strong and sturdy, and is finished in a beautiful mirrored chrome. Your rail is supplied flat packed and is easy to assemble.